1. Mix sugar and water in a pan. 2. Place over moderate heat and cook. 3. Add 1 to 2 tsp of milk and remove any impurities that float to the surface. 4. Drain and transfer to another pan. 5. Place over moderate heat and cook till a one string consistency is reached. 6. Add powdered cashews and keep stirring constantly. 7. Add liquid glucose and stir. 8. Continue to simmer till it achieves a dosa batter like consistency. 10. Once it has reduced to a chapati dough like consistency, divide into 3 or more portions. 11. To each portion add one food colour and shape them into flowers. 12. Decorate with the silver warq. 13. Arrange on a plate and serve. Note: An easy way to make the flowers is to shape them into oblong (or any other shapes) and then carve the petals using a knife. 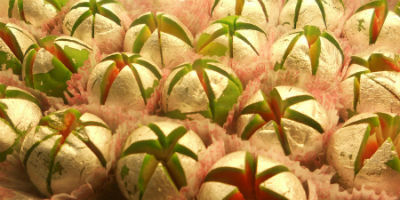 Feel free to comment or share your thoughts on this Kaju Flower Recipe from Awesome Cuisine.